How to Make Patients Like You in 90 Seconds or Less | Passive Income M.D. The title of that book speaks to me, because as an anesthesiologist, I often don’t get much longer than ninety seconds to establish rapport with my patients. In that tiny window, I’ve got to make them feel comfortable and understood. Of course, I’ve also got to gain their trust. I’m about to hold their lives in my hand, so trust means everything. However, anesthesiologists aren’t the only ones with limited time for building rapport. For example, an ophthalmologist might see upwards of sixty patients a day. An on-call surgeon may see dozens of her partner’s post-ops over a weekend. Then there’s the Emergency Medicine attending physician with a packed E.R. who may have just seconds with each patient. You get the idea. The question then becomes this: Why do we care? Regardless how you feel about it, let’s face it, HCAHPS (Hospital Consumer Assessment of Healthcare Providers and Systems) scores and surveys are here to stay. Obviously, all doctors and hospitals are invested in providing high quality care. However, now that patient satisfaction scores are tied to reimbursement, in order to protect revenue, administrators are getting further involved. Yelp reviews. More than ever before, patients are turning to social media to choose their physicians. I have my own opinions on this, but in this day and age, there’s no question that social media is an established consumer-engagement platform. In fact, articles like this and are popping up in major publications, lending those platforms even more credibility. Online forums and Facebook groups are mentioning physicians by name. This can be extremely beneficial for your practice–or it can be devastatingly damaging. We may live in an age of technology, but the word of mouth referral system is still the strongest method by which physicians get their patients. Happy patients mean more referrals. It’s been shown that there is a strong correlation between lack of perceived physician empathy and communication and a higher number of malpractice claims. 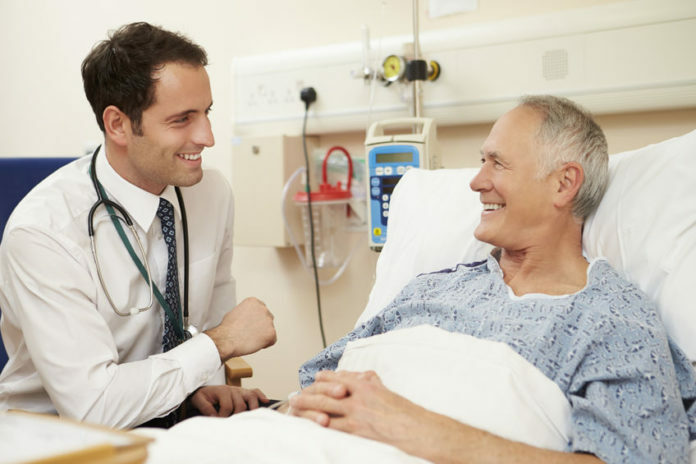 It’s clear that a good bedside manner is crucial not only to the physician-patient relationship, but also to the overall success of that physician’s practice. Though the precise statistics are up for debate, most researchers and well-known presenters will agree that the greatest part of communication isn’t the words you say. An overwhelming proportion of it is non-verbal. Moreover, it has been shown that likeability is a learned skill and can be both improved and developed. Though these skills come more naturally to some than others, they can be learned. It just needs to be intentional. In the interest of specificity, I’ve taken the liberty of updating some of the tips from How to Make People Like You and tailoring them specifically to physicians. 1. Be open – Keep an open attitude and maintain an open body posture (keeping your heart directly pointed at your patient). No folding your arms. Additionally, it’s actually been shown that opening your coat helps put the other person at ease (in this case, your white coat). 2. Use your eyes – Be the first to make eye contact. Look at your patient directly in the eyes with a positive attitude. Be intentional about this. Try to notice their eye color. 3. Beam – Be the first to smile. Even if we are treating a serious issue, we can still offer an appropriate smile when greeting our patients. Be the first to talk. Say, “Hello, I’m Dr. ___” and be the first to extend your hand in greeting. Make sure to say their name out loud several times. 4. Lean – Slightly lean toward the patient. This demonstrates your concern for what they have to say. Next comes the establishing of rapport or finding common ground. In this case, physician and patient are here for the same reason – to provide the best and most appropriate care for the patient. 1. Attitude – We want to portray an attitude of warmth, caring, sincerity, and confidence. 2. Synchronization (of body language and tone of voice) – People are naturally drawn to others in synchrony. Imagine a scenario where you’re sitting at the patient’s level, facing them and speaking to them in a consistent tone of voice. Now, imagine a situation where the patient is sitting, speaking in a quiet voice, and the physician is turned away to a computer speaking roughly and very loudly. That’s an example of asynchrony. Whenever feasible, match the tone of voice and body language of your patients. 3. Conversational skills – Using more open-ended questions. Yes, for a medical history, often times we have to go down a very specific list of yes/no questions, but make sure to follow it up with something more open-ended and personal. Say, “Is there anything else you’d like to tell me?” and “How do you feel about what you’re going through?” Active listening involves trying to get to the underlying feelings behind what the patient is saying. Summarize what they’re saying and ask follow-up questions. These simple steps may come easy to some. For others, you may need to be more intentional. However, we can all agree that interpersonal skills and establishing good rapport are very important – not only for quality patient care, but also for increasing patient satisfaction and referrals, and lowering your risk of malpractice suits. I also think it helps with self-fulfillment and job satisfaction as a doctor. Our first responsibility is to always do what’s right for the patient. I don’t know about you though, but when I know that the patient likes me, I also feel better about what I’m doing. Previous articleHow I Launched My Real Estate Investing Career with $5,000.